New York February 2005. I arrived in New York for a weekend stop over on the way to San Francisco. I wanted to visit the The Gates in Central Park. I was hoping for some snow during the night and some sun for Saturday morning. 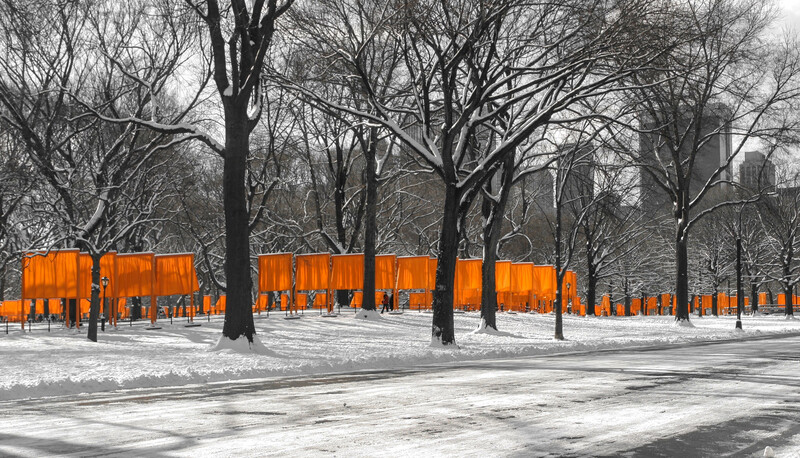 I wanted to capture the glowing orange fabric surrounded by the bright white environment. When I woke up Saturday morning, I was surprised to see that both wishes had come true. There was sun and snow! Awesome. The image was taken with a Canon EOS 10D and the Tamron AF 28-75mm f/2.8 SP XR Di LD Aspherical (28mm, f/6.7, 1⁄250, ISO 100). I used Adobe Lightroom 6.8 to sharpen, crop and increase the contrast of the image. I reduced the saturation for all colors except orange. Feel free to share, leave a comment or just enjoy looking at it.